As compared to normal height toilets, comfort or right height toilets are much higher, with the height from the floor to the top of the rim usually being 17-20 inches. This may not work for kids but for adults and persons with disabilities, this is the best kind of toilet to use. The reason for this is because with a higher seat or rim, you get to bend down less and this reduces stress on your joints when sitting or standing up. In the end, it becomes more comfortable to use and hence the name comfort height toilet. 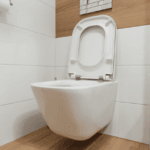 However, since it is important that you get a good quality unit, this article looks at the best comfort height toilets, so as to make easier for you to pick the perfect fit for your home or office. 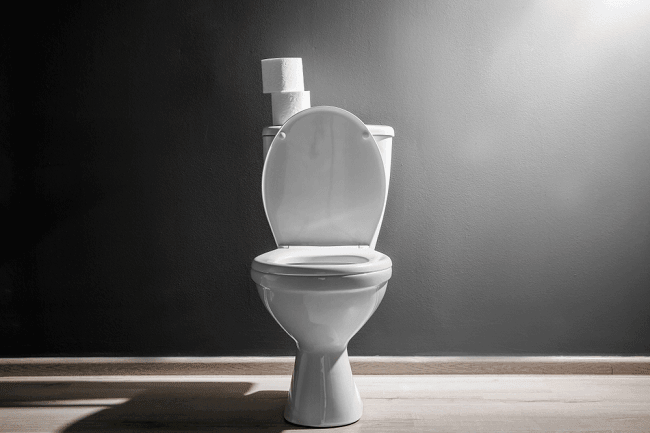 After thorough research, we have compiled this list of the best comfort height toilets. Go through it and pick the one that you prefer the most. Not only does Kohler’s K-6669-0 offer a comfortable seating height for adults, but is also has an elongated bowl that makes it much more comfortable to sit on. Besides this, the toilet has a clever design that makes it very easy to clean. 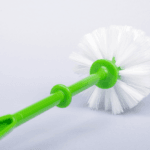 Basically, this design conceals its trapway and this reduces the nooks and crannies that would otherwise be present in other toilets, making it very easy to wipe any dirt from its flat, boxy surface. Flushing the K-6669-0 is also quite efficient, featuring a 1.28 gallon per flush system that can conserve up to 16500 gallons of water per year. This system is activated by a left-hand polished chrome trip lever, which is strong enough to handle regular use and has a smooth surface for easy wiping. Inside the water tank, the flushing mechanism utilizes a durable aqua piston canister design, whose seal is 90% less exposed than regular 3-inch flappers, making it less susceptible to leaks. This canister also gives a more powerful flush by allowing water to flow into the bowl from all sides. Other features include vitreous china construction, availability in 6 different colors (white, black, biscuit, ice gray, almond, and dune). Elongated bowl for more comfortable seating. Concealed trapway design for easy cleaning. Efficient 1.28 gallon per flush system (can conserve up to 16500 gallons of water per year). Durable aqua piston canister design with a less exposed seal is 90% less exposed for leak-free performance. 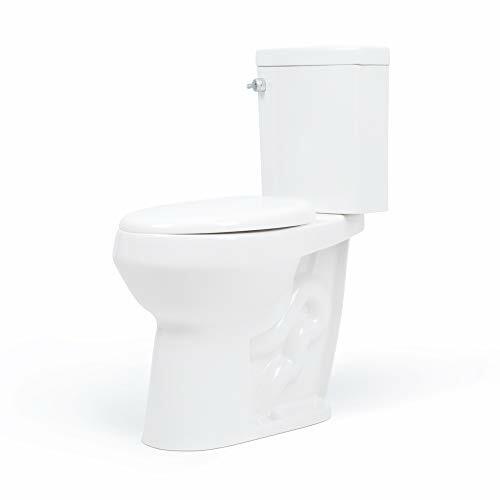 As the name suggests, Convenient Height’s 20-inch toilet has a convenient and comfortable 20-inch bowl height from floor to rim, and this makes it very safe to use by adults because they can sit and stand up more easily. On top of this, it features an elongated bowl, which further adds onto the comfort. On water efficiency, a dual flushing system is used and it consists of a light flush that releases 0.9 gallons (activated by pushing down the handle) and a full flush (activated by lifting the handle). The full flush releases 1.28 gallons and is meant for solid waste. This makes it save a lot of water in the long run. Despite releasing this low volume of water per flush, it pushes it out with a lot of force and this can be attributed to a canister flush valve, which ensures that water goes down at a very high velocity so as to force everything down into the drains. In terms of structure, this toilet comes in 2 pieces (separate bowl and tank) and setting it up is quite easy. It also comes with a slow closing toilet seat that matches its color (white). On the downside, its trapway is not concealed and this makes it a little bit difficult to clean because of the slightly rugged base. Convenient 20-inch height from floor to rim. Dual flushing system (light flush releases 0.9 gallons and full flush 1.28 gallons). Comes as 2 separate pieces. Comes with a soft close toilet seat. 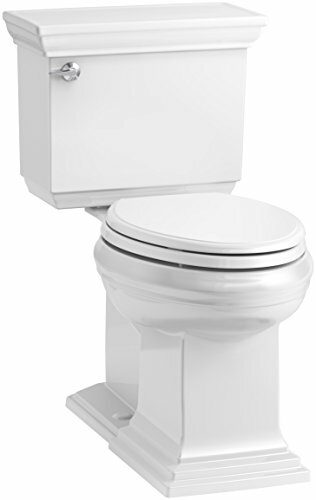 Kohler’s K-3609-0 is also a two-piece toilet that is made up a K-4309 bowl and a K-4421 tank, and these two are very easy to install, featuring a dry-lock installation that lets you connect them very quickly. In terms of comfort, the bowl has a height of about 17 inches, which is slightly higher than the normal 15-inch toilets. This makes sitting and standing up much easier for adults, and especially the tall ones. Apart from this, the unit has an elongated bowl that is more comfortable to sit on than a round one. On flushing, Kohler’s canister flushing valve is used and this results in increased water savings and improved flushing performance. In actual numbers, the system releases 1.28 gallons of water per flush (giving you savings of up to 16,500 gallons per year) and this water is forced down from all sides (360), coming out with a lot of force so as to push everything down the drains. 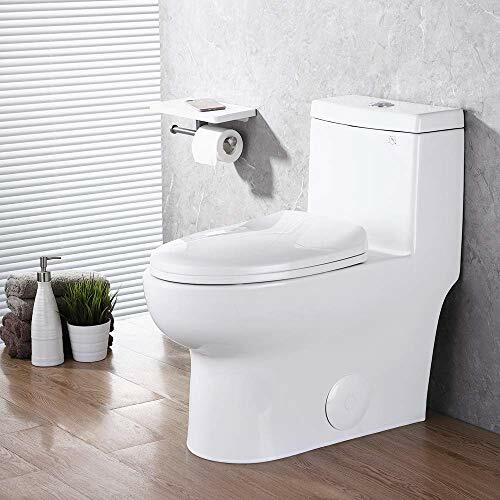 Construction wise, vitreous china is used to build the toilet, making it strong and durable. Several color options that include white, almond, sandbar, biscuit and ice gray. Two-piece toilet consisting of a K-4309 bowl and a K-4421 tank. Dry-lock installation for connecting these two parts. 17-inch height from floor to rim. Left hand polished chrome trip lever. Available in 5 colors (white, almond, sandbar, biscuit and ice gray). 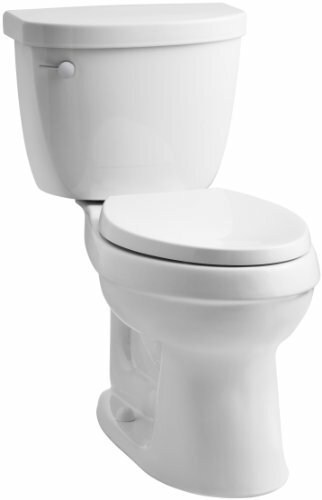 If you want an extremely easy-to-clean toilet, then you should consider buying American Standard’s 2886518.020. This is because it is built having an EverClean surface that inhibits the growth of odor-causing bacteria and is also resistant to staining. Structurally, the unit consists of two pieces (tank and bowl) and both of them are constructed using vitreous china, making them strong and durable. The bowl has an elongated design and is set at a height of 16.5 inches, making it comfortable for adults to sit on. On operations, you get a dual flushing system, with the light flush pushing down 0.92 gallons of water while the full flush releases 1.28 gallons, making it highly water efficient. 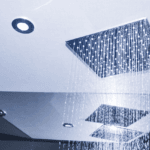 This is made possible by a siphon jet bowl technology gravity system with a powerwash rim, which ensures high water efficiency and powerful flushing performance. Two intuitive buttons placed at the top of the tank are used to do the actual flushing instead of the conventional lever handle, with one having 3 dots for the light flush and the other having 9 dots for the heavy flush. Other features include 3 color options (white, linen and bone). Stain resistant EverClean surface that also inhibits the growth of odor-causing bacteria. Elongated bowl at a height of 16.5 inches from the floor. Available in 3 color options (white, linen and bone). KES’ cUPC is a 1-piece toilet that is very easy to set up because the tank and bowl are permanently combined; no assembly is required between the two. For easy setup, the unit comes with several accessories and these include a soft closing toilet seat, 2 side covers for hiding the mounting bolts to the toilet flange in the floor below, 2 bolts and a wax ring for attaching it to the flange. This means that you get a complete set at a very affordable price. In terms of performance, this unit features a very efficient dual flush system, with top mount buttons that let you choose between a light flush and a full flush. 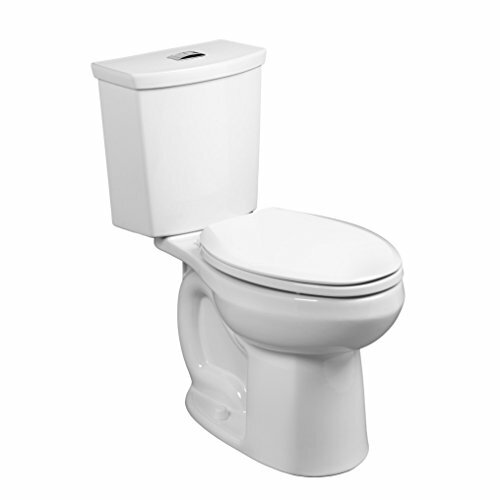 Construction wise, ceramic is used and the toilet is designed having a wide base for stability and weight distribution. This ceramic has a fully glazed finish and this makes it resistant to stains for easy cleaning in the bowl. It also has a skirted trapway without corners, making it much easier to clean on the outside. Other features include a white only color option and availability in a style A boxy shape toilet or style B smooth curved toilet. Comes as a complete kit with all the accessories. Ceramic construction with a wide base. Fully glazed finish and a skirted trapway for easy cleaning. Comes in two styles: a boxy and curved toilet. 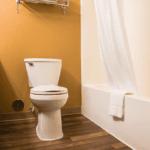 Before buying a comfort height toilet, you should consider the following. Shape primarily refers to the design of the toilet bowl. Round toilet bowls are good for space saving in your bathroom but are not very comfortable to sit on, especially if you like taking your time. On the other hand, elongated toilet bowls are much more comfortable because of the extended surface area, but may occupy more space in your bathroom. Therefore, you should choose the bowl’s shape according to the space that you have to spare. This is a big factor to consider because ultimately, it determines the water bills that you should expect. Generally, WaterSense certified toilets with at most 1.28 gpf are good enough and have the potential to save up to 16,500 gallons of water per year as compared to other regular toilets. However, the ones with a dual flushing system are more efficient because you get a light flush that releases about 0.9 gallons of water and a full flush of 1.28 gpf. This system is the most efficient and is highly recommended. Most modern toilets are usually made using porcelain or ceramic (vitreous china is widely used and it is a type of ceramic). Both of these materials are very strong and durable, and the difference between them is not very big. However, always ensure that the toilet you buy has a stain-resistant coating over its core material so that it is easy to clean and maintain. All types of toilets are either 1-piece or 2-piece. A 1-piece toilet basically has its tank and bowl permanently joined together, meaning that it requires less assembly work on site. However, this design makes it more difficult to handle because the piece is larger and heavier. 2-piece toilets require a bit more work when assembling and may have some leaks between the tank and bowl, but are easier to handle when doing the installation because each part is lighter on its own. Color is just for aesthetics. It does not affect the performance of the toilet in any way. Even though you can pick any color that you prefer, it is recommended to choose a color that closely matches your bathroom’s interior so that the toilet can look and be a part of the room. Accessories are very useful to have because they eliminate the cost that you would otherwise incur when buying those extra items. 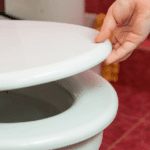 When it comes to comfort height toilet seats, and all types of toilets in general, accessories include toilet seats, installation bolts, and wax rings among many others. Basically, the more you get, the better the kit. In conclusion, comfort height toilet seats are the go-to option for adults, especially if tall, and persons with disabilities because they are easier to sit on and easier to stand from. After going through the 5 products above, it is our hope that you will find the best comfort height toilet that you can install in your home or office.